Just something I really enjoy doing. It takes very little fabric and time, yet it is just so much fun. 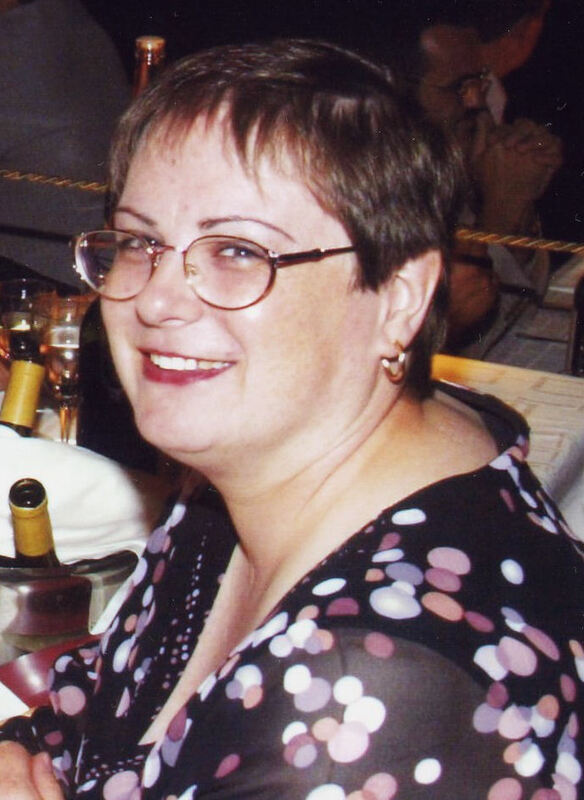 Meet Genine, the designer of the doll clothes. She trusted me to test some of her pattern and oh, how I love that 'job'. Sam was thrilled when she got to model her romper. She was very excited she got to go outside and play. 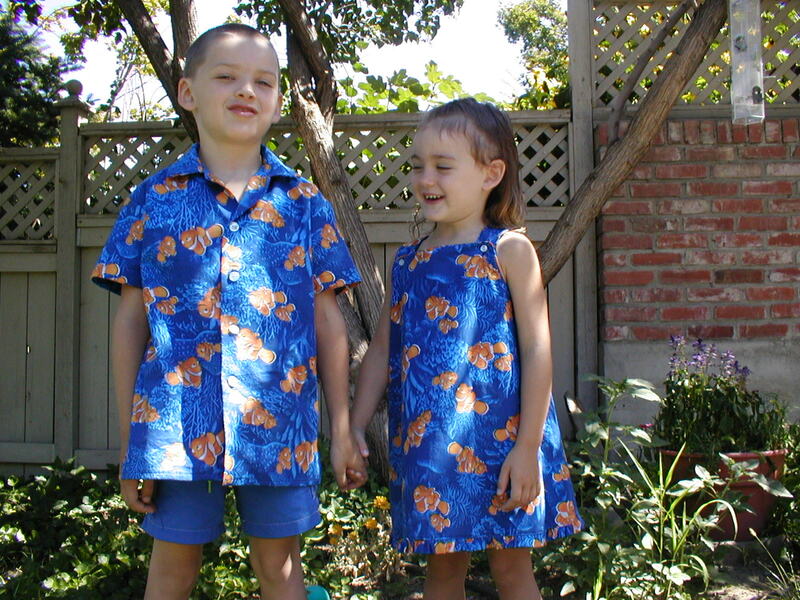 Same pattern only the long rompers. Sam also loves working in the garden. Sam, even likes getting ready for the holidays. Soon she will be wearing her October outfit. This year Sam has a friend who will model with her. Her name is Elisabeth. They love spending time together. One question I run into often is-- Can you smock for the older girl? Yes, you sure can. You can even smock for adults, smocking does not have to be just about little people or ornaments. 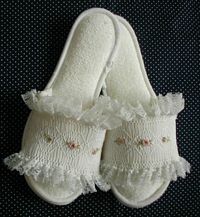 It is a form of embroidery and I know there is a whole lot of embroidery out there in sewing land. 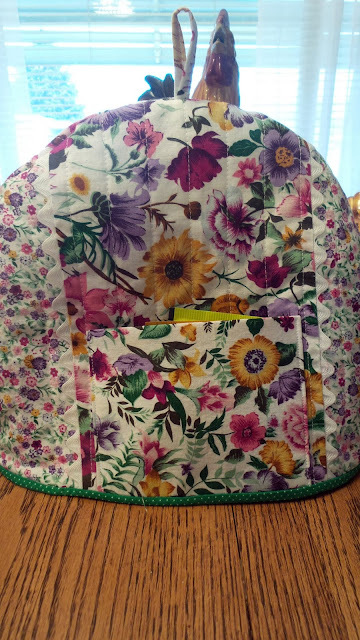 This pattern is called "Roses for Rachel" and was in a Sew beautiful magazine. Zoe, defiantly was not a toddler. she loved her smocked dresses. She loved this smocked top. Again, perfect for a growing girl. I have another idea, I will give a gift to the first person that replies to this post, that is also a member of Apple Valley smockers. Well, you missed this one--maybe I will offer a gift in the future. 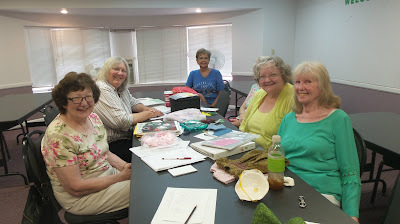 what are your sewing memories? I bet you have a ton of them you could share. 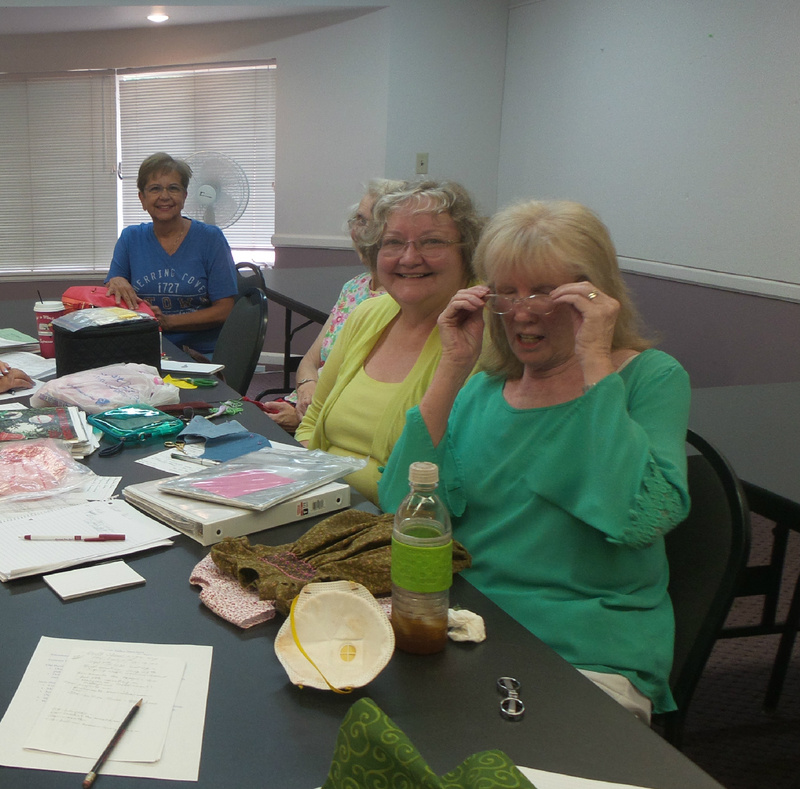 when asked to share a sewing memory, it was hard to think of which one to share. 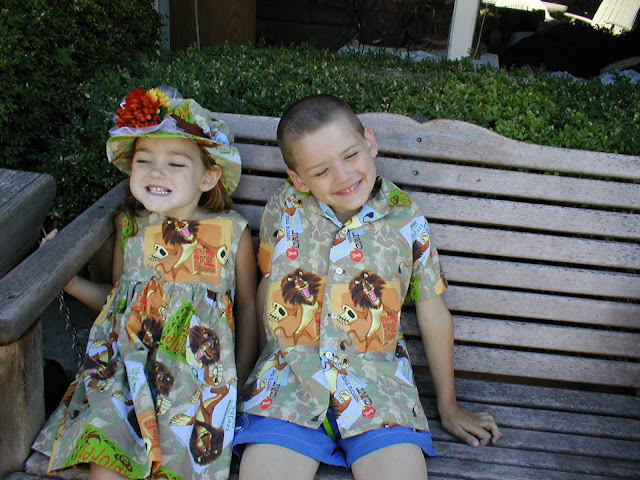 This time of year the memory that stands out for me is that of sewing back to school clothes. I of coarse did that when my kids wee little but was back to sewing school clothes for my daughter when she ended up being a single working mom. I felt the one thing I could do to help her was to keep the kids clothed. So from kindergarten to Jr. high I made their wardrobes. One year, I was late (by one day) of getting Zoe's outfit made. Zoe let me know she was not to happy about that!! Not to worry, she had her outfit by the second day. One of a kind, was what Seth always said about his shirts. No, I did not always make them matching outfits. One of her favorite outfits. You can add smocking and still give a big girl feel. I have ton's more, hope you share some of yours. I just can't seem to sew. I have even caught myself thinking, the serger is in the shop and so I can't sew!! Well, that is very, very silly of coarse I can sew. I am not one of those serger owners that can make their machine stand up and dance. Mainly I finish seams or make sweatshirts or those darling knit jammies. 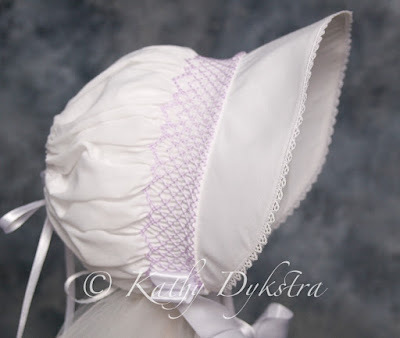 Then there are the ruffles you make with the gathering foot. 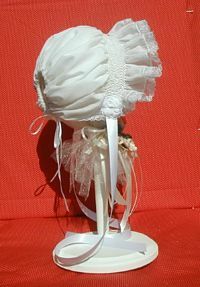 I love adding ruffles to the bottom of shorts or the bottom of anything that seems like it would stand up to a ruffle. So I have used all sorts of scraps to make ruffles to have on hand. Now, can you make ruffles on your sewing machine?? of coarse you can! 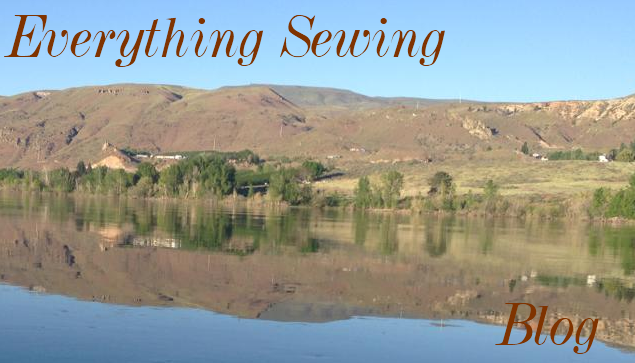 A serger is nice to have, do you need one? probably not. I hope my serger doesn't need repairs anytime soon. For now, all is well in my sewing world. I miss Betty so much. Betty, was my sewing friend who kept me inspired and sewed almost everyday, well into her 80's. I feel lost without her. When I had a problem or felt sad I could always go to Betty and she knew just what to say. Betty, also did a lot of what I call 'how to's' because that's how you make it or do it. This picture was taken all in fun. On the forum we had held and ugly fabric contest and this is what she made using that fabric. We had such fun with that pose. Other things Betty did were creative and if you want to follow the complete instructions then you will find them HERE! a very popular project for our group. I fixed the links so they work. Our group is pretty small right now. Some didn't show for the meeting, which makes the group even smaller. We were meeting in a quilt shop but sadly that store went out of business. So now we meet in a beautiful church in the historic part of town. Great lighting and with the group we are always inspired to create. We have lots and lots of discussions. What ever we do, we have fun. 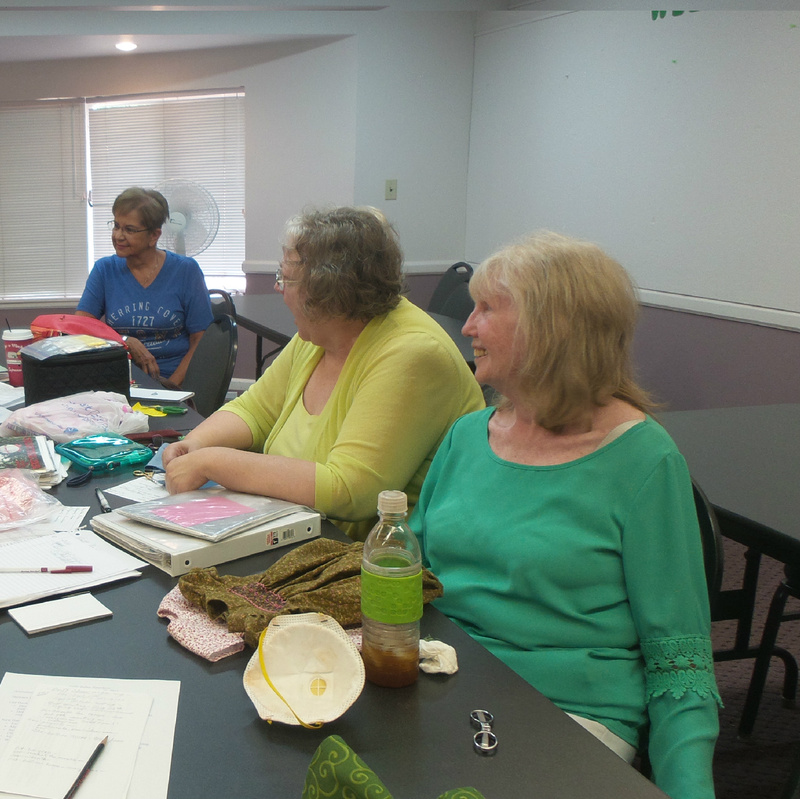 I so enjoy my time with these gals and love meeting new members. 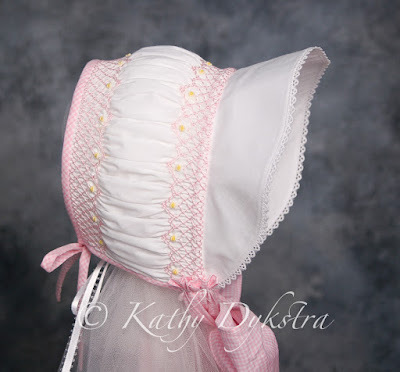 My new project will be a smocked bonnet designed by my blogging friend Kathy. Kathy is so talented. she is selling the pattern on Etsy, not sure of the link but I think you can find it here. She has made the pattern in those two different versions and in all sizes. also do not forget to check my other blog. you will find that one when you click here. Be sure to sign up!! I have never given up on a sewing project before. Even the projects I thought I would like and ended up not likeing them, I would finish and give it away. 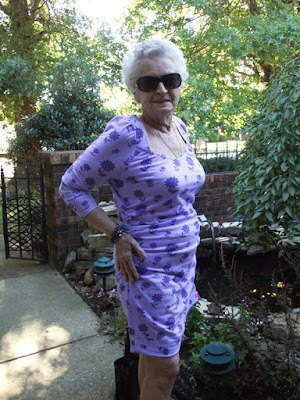 This was the dress to be and that is the fabric. So light that it wants to float away and several times it did! It would stick to itself, so I tried spay starch, thought I was making some headway using the starch. No!!! that ended up not working. Seams would pucker, no matter what I tried to do with them.